A Golden Age Wonder Woman foe of some repute. 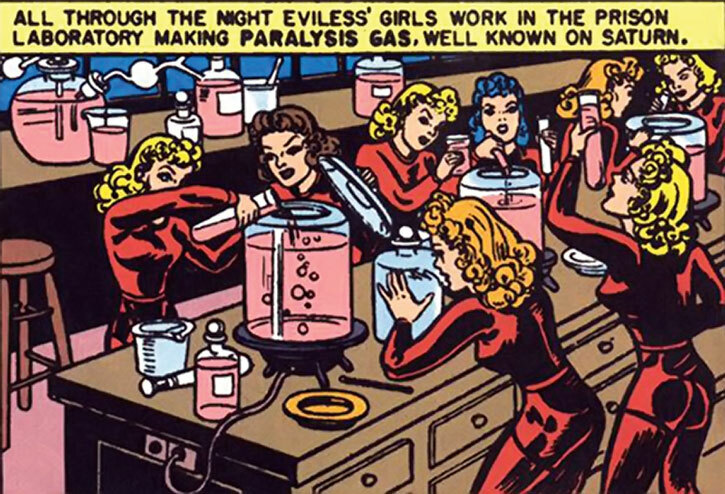 Not only is she called “Eviless” (which is great), but she led the original version of Villainy Inc., an atypical example of Wonder Woman having “super-villains” of a sort. Base Of Operations: Mobile, formerly Saturn. Height: 6’1” Weight: 156 lbs. 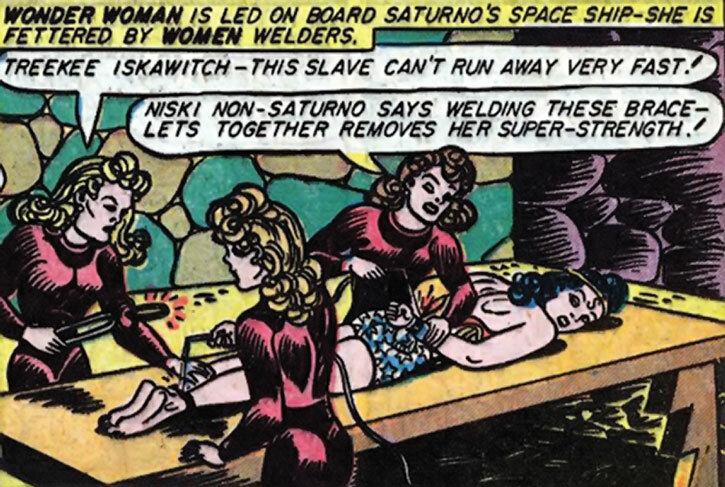 The existence of the Saturnians (sometimes called Saturnites or Saturnics) became known to Earth in the Fall of 1944, thanks to Wonder Woman. But they had been operating on Earth for years. Saturn is a slavery society – slaves seem to represent the vast majority of the population, and some were taken from Earth. The role of the free members of society is apparently determined by gender. Women drive the slave labourers, whilst men only engage in science and war. It is quite possible that the entire free population of Saturn is but a few hundreds or thousands people. The Saturnic ringleader on Earth was a man, Mephisto Saturno (no, really). He apparently was behind much of the Earth slaves procurement in the early 1940s. Saturno is later revealed to be a duke, hinting that there is at least a symbolic remnant of a feudal system on Saturn. Saturno seemed to have dozens of subjects (plus slaves), who seemed more loyal toward him than the Emperor. Free Saturn folks are extremely scientific and rational, and their culture values acting without emotion and seeking the greater good of Saturnics. They are vaguely Satanic for some reason (the Emperor swears by the sacred Mephistopheles and has horns the others lack), as well as domineering and sadistic. They are more rational than they are evil, though. Saturnians all seem to be tall, attractive, very fit and quite muscular. Another cultural trait is that Saturnites apply the væ victis approach with a vengeance. People who fail at something major (such as a mission on Earth) are immediately made into slaves, and slaves are not treated well at all. The apparent ratio between free persons and slaves may in fact stem from centuries of rigid disenfranchisement of anybody who runs into a problem. Saturn has the usual 1930s space opera tech – rayguns, spaceships, gravity guns and reverse-gravity cannons, etc. Think Buck Rogers. They could also psychically make themselves invisible to humans. I don’t think Saturn was mentioned again after the 1940s, though. The usual caveat – Wonder Woman tales of that time were taking place in their own, fairly plastic continuity. They can, by wincing very hard, be said to have taken place on Earth-2, but this is a post-hoc hypothesis that is only useful if you absolutely have to attach them to another continuity. The Earth-2 clue comes from a later story, as mentioned in our Villainy, Inc. profile. Eviless does not appear to have any special powers, but she’s mean and aggressive, and an experienced slave-driver. As such she’s good at securely binding people, which is important in period Wonder Woman stories. Like most Saturnians she’s tall, healthy and strong, especially by 1940s standards. In fact, in her intro panel she’s markedly taller and more muscular than Wonder Woman. The “Saturnic power of hypnotism” can completely block the senses of most Earthlings, making trained Saturnians invisible and inaudible. They do not routinely employ this power, though, despite its usefulness. Eviless can also make herself ’die‘ through concentration – she falls, her heart stops, her body grows cold, etc. She maintains some rough awareness of her surroundings in that state, but presumably cannot stay “dead” for too long before her body starts suffering actual damage from the flat ECG. Eviless is a capable planner and leader. Though on Saturn science is male business, the females are also capable chemists, and could quickly brew up a fairly good paralysis gas. Eviless was a Saturnic girl, and thus a slave-driver – apparently an experienced and senior one. 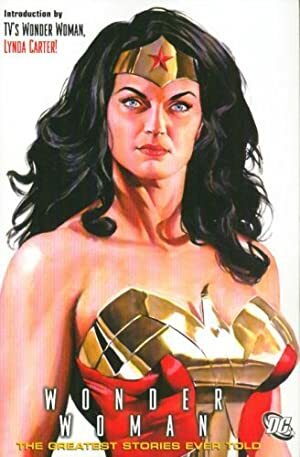 Though she was not named at that point, she was present on Saturn during the first encounter with Wonder Woman, and was the one who worked on making a good slave out of Steve Trevor, starting with under-nourishing him. Wonder Woman and Steve Trevor soon escaped, however, and derailed the nefarious Saturnic plans for invading the Earth (cue 1980 Flash Gordon theme music). Mephisto Saturno managed to capture Wonder Woman (and two Holiday Girls, including Etta Candy) and ship them to Saturn. The 3 Earth captives freed themselves whilst still en route, knocking out the guards (likely including Eviless), and Wonder Woman subsequently brokered a peace treaty with the Emperor of Saturn. Despite the treaty, Saturno wished to gain his revenge against Wonder Woman for having defeated him. He and a large numbers of his supporters came to Earth to do just that, and managed to capture Steve Trevor, another Army man, Wonder Woman and a number of Holiday Girls. Eviless was among the invisible, inaudible crowd of Saturnians, helping bind Wonder Woman (futilely, since bonds have to be applied by a man for Golden Age WW to be unable to break them). Saturno and his faithful were defeated by Wonder Woman, then arrested. 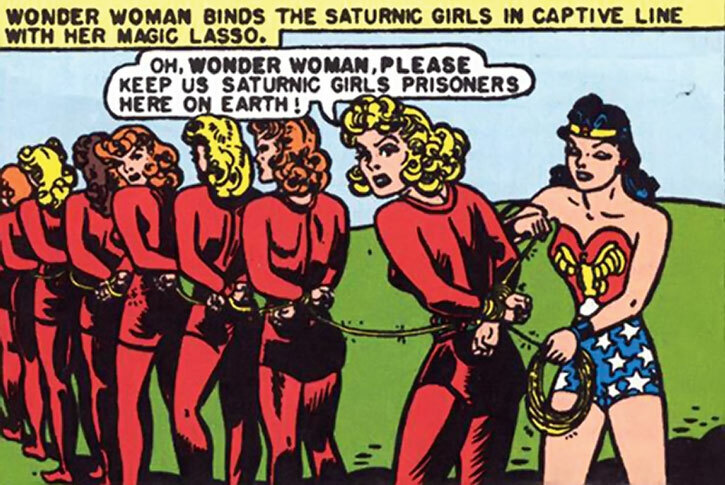 Wonder Woman formed a column of male prisoners and one of female prisoners, but Eviless pleaded with her not to be taken back to Saturn, where they would be made into very poorly-treated slaves. WW agreed, and took the Saturnic girls to Transformation Island. There they were imprisoned by Mala, the Amazon prison chief. The devious Eviless faked a heart attack via Saturnic controlled breathing. She used this distraction to steal Wonder Woman’s golden lasso and jimmy up her Venus Girdle. The Girdle is a magical item the Amazons put on prisoners to “remove all desire to do evil and compel complete obedience to loving authority”. Eviless escaped, freed the other Saturnic girls from their girdles, and they surprised and captured the guards. 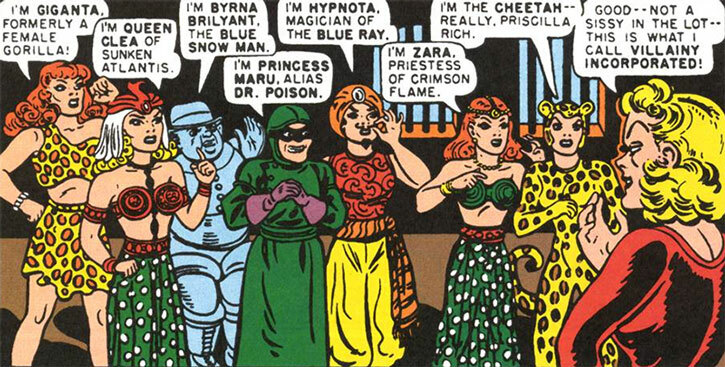 The red-clad alien vixens then freed many other prisoners from Mala’s prison, and Eviless assembled a cadre of sworn Wonder Woman foes from their ranks – Giganta, Queen Clea, the Blue Snowman (who is actually a girl), Princess Maru, Hypnota, and of course Cheetah. She called her group Villainy Incorporated. With those assets, a pile of Venus Girdles and especially the golden lasso, Eviless and her operatives managed to capture Queen Hippolyte. They forced her to summon all Amazons to the Assembly Hall, then gassed them using KO gas. They then had Hippolyte summon Diana to Paradise Island to be ambushed, but Wonder Woman repulsed all attackers until Eviless threatened to kill her mother. Wonder Woman escaped soon after but was recaptured whilst saving Eviless, who had been thrown into water when WW escaped and was drowning. Though Eviless had by that point conquered all of Paradise Island, they ran out of Venus Girdles. 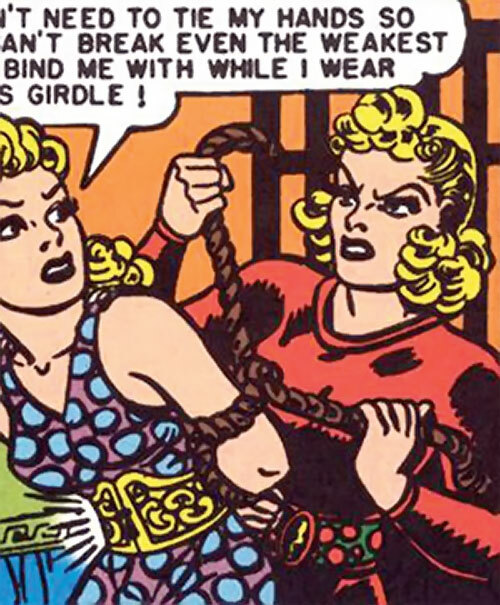 Eviless had some girdles removed from prisoners of the Amazons to use them on her own captives. 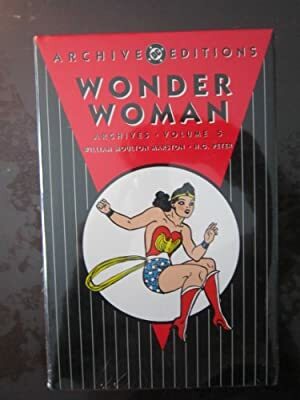 However, many of the prisoners had been successfully reformed through advanced Amazons methods, and were now loyal toward Hippolyte and Wonder Woman – and trained in Amazon strength and skills. Led by one Irene, the reformed prisoners stormed the prisons to free Wonder Woman and the Queen. Eviless and all other Villainy Incorporated members save four were then captured. Eviless was never seen after that, AFAICT. She could easily be reintroduced, though – she’d be an excellent Female Fury, and “Saturn” could be an area of, or a satellite of, Apokolips. Well, she’s called “Eviless”. As the ever-lovable Ben Grimm, idol of millions, would put it – whaddya expect ? She’s mean, underhanded, quite resourceful, and swears by Mephisto. Saturnians come from a super-competitive society that crushes all those who stumble, and knows no gratitude. Eviless has not appeared in the post-Crisis version of the 1940s. Of course, the whole Saturn thing would be hard to keep, but she could easily be a rogue Thanagarian scout out to establish her own empire on primitive Earth, or a philonazi agent from Yet Another Imaginary Country. The uniforms and hairdos were not terribly different from those of XXXth century Titan, and at one point they used a form of mental invisibility. Having them be Titanians in exile who accidentally ended up in the past could work. Eviless would then have some degree of super-telepathy. They would have managed to return to the XXXth century in the early 1950s. 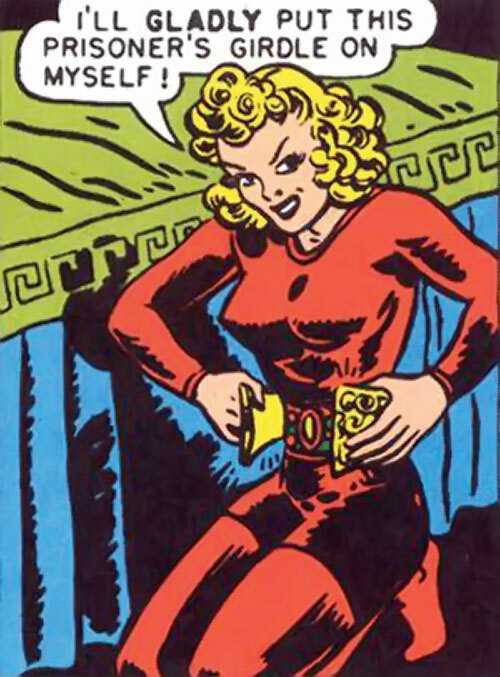 Or she could be from Atomia, from DC’s equivalent of the Microverse. Really, Wonder Woman ran into strange civilisations all the time (that was sort of the point), so this should not be much of a problem. Eviless… slave driver from Saturn ! The “Saturnic power of hypnotism” (Invisibility) was only used by Saturnians once, so lengthy preparation (or some other major prerequisite) might be necessary before it can be made active. Invisibility covers both visuals and audials. Certain subjects can concentrate hard enough to ignore Invisibility. If full RAPs are gained by pitting INT/WIL against Invisibility/Invisibility, the person becomes able to see and hear Saturnic agents (though they will still be looking transparent) for at least the rest of the adventure. Iron will only applies against attempts to make her feel gratitude, pity and other empathic feelings. Expertise (Slave driving), Language (Saturnic), Misc. : Eviless can plunge herself into a deathlike trance. Slave drivers from Saturn (Low). MIA toward Power, MPR (has no idea about how to swim). Back on Saturn, Eviless had a whip and a raygun. Concealment 5 (All visual senses and normal hearing), Resistible by Will. Enhanced Impervious Will 4 (Limited 3 – Only vs. effects that trigger gratitude, empathy, pity, etc.). Accurate Attack, Close Attack 3, Ranged Attack 5. Athletics 2 (+4), Deception 4 (+6), Expertise (Saturnic science) 3 (+6), Expertise (Slave-driving) 7 (+8), Insight 6 (+8), Perception 4 (+6), Persuasion 3 (+5), Sleight-of-hand 7 (+8). Disability Has no idea how to swim because she’s from Saturn. Trade-off areas Attack & Effect PL 5, Dodge/Toughness PL 5, Parry/Toughness PL 5, Fort & Will PL 6. Point total 80. Abilities 30, Defences 14, Skills 18, Powers 6, Devices 0, Advantages 12. Equiv. PL 6. Source of Character: DC Universe (Wonder Woman).